Thank you all for the birthday wishes! It’s been a busy time around here with the new place, new car and new job but the exhibition lives on! This time around we had 12 entries. Myself and the other judges: Foodaphilia, Just Call Me Marta and Appoggiatura put on our virtual tongues and picked our favorite recipes. While the real prizes here are the glorious peanut butter recipes, the first place winner has been contacted and will receive a jar of cocobanana peanut butter! Read on for the outstanding recipes and let the celebration commence! 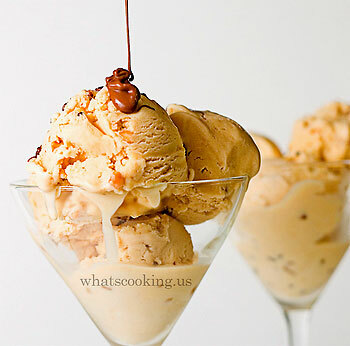 1st Place: Tres Leches Peanut Butter Icecream by Ben at What’s Cooking? was the overall favorite. This incredible looking dessert is well deserving of the first place prize! Enjoy your peanut butter Ben! 2nd Place: Fluffernutter Cupcakes by Evan at Food Makes Fun Fuel were an excellent runner-up for the celebration. I couldn’t taste it but the presentation made it look good! 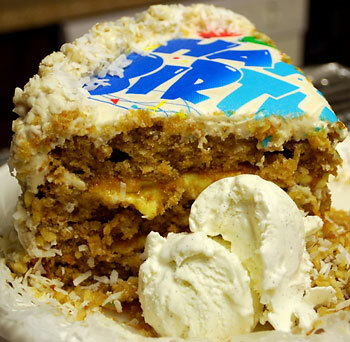 3rd Place: The Peanut Butter Celebration Cake from Joanne at Apple Crumbles is the perfect cake in my opinion. Who wouldn’t want a slice of this? Peanut Butter Chocolate Covered Pretzel Balls – from Baking and Boys! 1. Preheat oven to 350°F (180°C). Lightly coat an 8″x8″ baking pan with nonstick cooking spray. 2. In a large bowl, add in the “yogurt,” canola oil, turbinado sugar, vanilla extract, and molasses. Mix well. In the same bowl, add in the flour, baking soda, and crushed peanut butter pretzels. As the mixture starts to thicken up/combine, add as much nondairy “milk” as you need (but not too much) so that the batter is mixable. 3. Pour mixture into the 8″x8″ baking pan (coated generously with nonstick cooking spray). 4. Bake for about 32-35 minutes, until a toothpick inserted in the center of the blondies comes out clean. Makes 16 blondies. While “Peanut Butter Boy” sounds like a superhero name I am in fact human, and if I’ve forgotten anyone’s submission please let me know. Also, I hope ya’ll don’t mind that I touched up some of your photos a bit. What an amazing batch of peanut buttery deliciousness!!! Glad I could be a part of it…and can’t wait for future exhibitions! Congrats to the winners. And YUM! I hope to see you participate in the next one! Thanks a lot and I hope you enjoy the ice cream. It tasted amazing. 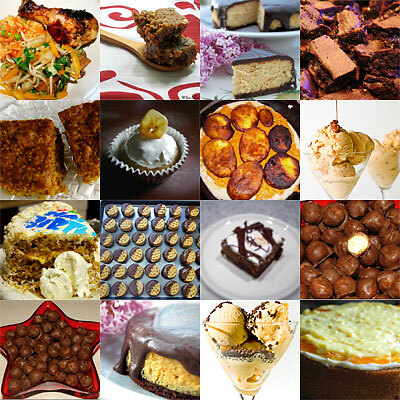 All the entries look very yummy. I am off to check them out. Love the enthusiasm! And congratulations! All photos look great. Now I’m on a mission to check them out. I can’t believe how much more peanut butter I eat since becoming such a fan of the Peanut Butter Boy! You’re addictive and obviously so are your Celebration Entrants. Be careful, soon you’ll be eating 2 jars a week like me! Yay! Haha my fudge actually tastes better than it looks… seeing it next to all these incredible food pictures makes me realize how bad of a photographer I am haha. And that “celebration cake” looks dee-vine!! Well so the picture didn’t come out perfect, it just takes a little practice. The fudge still sounded great! All the entries look fabulous! I can’t wait to try some. Thanks for all the hard work all. Happy belated birthday, Nick! Yea Evan, good stuff, keep up the good work! Well I wanted to make the fluffernutter cupcakes but I think he left out how much milk to use…anyone know?! I think he fixed it! Congratulations to everyone who participated this month! 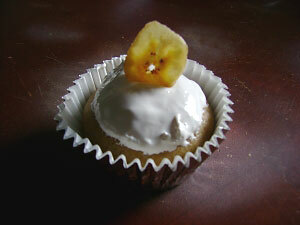 So many good recipes and entries – it was hard to narrow it down at all. Have a peanut-buttery day, y’all. wow, so much deliciousness… which to try first? ?